Longevity Of Flowering Bulbs: Are My Bulbs Still Good? When it comes to gardening, bulbs are in a class all by themselves. Inside of the bulb is a virtual storehouse of nutrients ready to feed the plant under ideal conditions. Bulbs planted at the correct time take care of everything else on their own, bursting through the ground in a colorful display when the time is right. When it comes to the longevity of flowering bulbs, proper care and storage can keep them healthy for years to come. So how long can you keep flower bulbs and how do you know if they’re still good? Keep reading to learn more about flower bulb shelf life. Bulbs that are not winter hardy in your area usually need to be dug up before the weather gets too cool and stored until the following spring. Generally speaking, spring flowering bulbs are known as hardy bulbs and summer flowering bulbs are tender. Proper flower bulb storage is important in order to keep the bulb healthy. There are a few things that are important to remember when it comes to maintaining the health of flower bulbs. While many bulbs can stand being left in the ground over winter, a few need to dug up and stored. 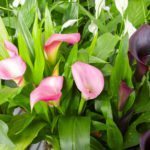 Among these are calla lilies, freesia, cannas and elephant ears. After you dig the bulbs up in the fall, be sure to wipe all dirt and debris away. This will help prevent rotting. Before storing, always leave your bulbs out in the sun for about a week to dry. Once the bulbs are dry, place them in a box filled with dry material such as peat moss, packing peanuts or sawdust. Put them in the material with the roots down, with space in between, as if they were in the ground. Cover them up and place the box in a dry and dark location. The storage temperatures for bulbs vary. Be sure that you know the temperature, as this will determine where you place your box. Some possible locations include a garage, basement, storage shed or attic. Prevent the bulbs from freezing and keep away from direct sources of heat for best results. Do not store bulbs in an area where you are storing fruit, as the ethylene gas given off by the ripening fruit is fatal to bulbs. How Long Can You Keep Flower Bulbs? Most bulbs, if stored correctly, can be kept for about 12 months before needing to be planted. The longevity of flowering bulbs is largely determined by the adequacy of the storage provided. Are My Bulbs Still Good? Most flower companies that sell bulbs will mark them with a best before date. While the flower bulb shelf life may last for more than one season when stored properly, be aware that the quality of the flower decreases with each season that the bulb does not go into the ground. Consider planting in a pot indoors if you cannot get the bulbs outside. Just be sure to provide adequate chilling time for fall bulbs. “What if I left my bulbs in storage too long? Are my bulbs still good?” A healthy bulb is firm and plump, not withered and overly dry. If it crackles when you squeeze it, it is probably outdated. Additionally, if they feel soft or mushy, they need to be tossed, as rot has set in. Composting ManuresPig Manure For Compost: Can You Use Pig Manure For Gardens?